This new range of Oils from Ken Bromley's are made in the UK from the finest pigments for durability and performance. The range of 21 colours in 225ml tubes was formulated originally for the professional user. Each pigment is ground in a refined Linseed Oil with the exception of the whites in the range which use Safflower Oil in addition to Linseed Oil. Our paints are roller-milled in small batches for superior blending. There are other very small components to control flow and structure including genuine resin gum turpintine but these would be seen as generally chemically inert. 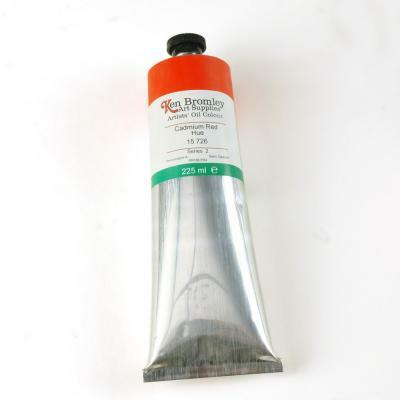 Ken Bromley's Artists' Oils offer you optimum quality at affordable prices. This range of oils have been modified and some colours do have small quantities of driers, but the parts per million will be very small . Some colours naturally dry quicker than others. Liquin is a drying agent and can be added to the oil paint to speed up drying times. I have only praise for your service. tried out the Ken Bromley own brand for the first time, ordered more the week after, totally satisfied.